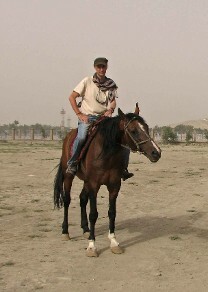 Long Rider Ian Robinson has just completed his third journey - in Afghanistan! New Zealand Long Rider Ian Robinson, who has made solo journeys across Mongolia and Tibet and written two excellent books, is now planning to ride across Afghanistan! Visitors may recall that Louis Meunier and Hadji Shamsuddin made a similar ride in 2005, and Louis almost died. But Ian, while not blind to the dangers, is finding out what his best and safest route would be. 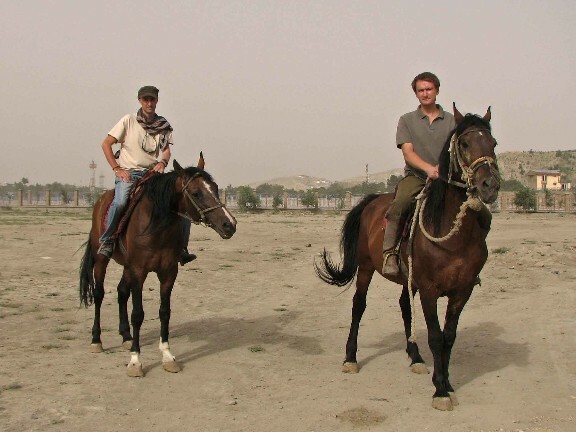 I am in regular contact with Louis in Kabul, who is giving me plenty of information from which I am trying to weigh up the risks, Ian wrote to The Guild. We wish Ian the best of luck in his preparations, and hope he has a safe trip across that turbulent country. Ian is leaving New Zealand and travelling to Afghanistan! In an email to The Guild he wrote: "I'm off tomorrow! At last! I'm indebted to the Long Riders, without your assistance this trip might not have come about! It's a great tribe to be part of! Louis Meunier sent an email to The Guild: "Ian left a couple of days ago to the North. He will reach Iskashim tonight, spend a couple of days there to arrange things...and set off for his journey. Enclosed is a photograph of us in Kabul." Click on picture of the two brave Long Riders on their stallions to enlarge it. I'm just back in Kabul, spent three weeks on horseback in the Wakkan and Afghan Pamir, a great trip but exhausting, and I'm satisfied with what I did: 400 kms., just a short one this time! Spent time with the Tajik villagers and Kyrgyz nomads, both hospitable and welcoming! I'm staying with Louis again, certainly this trip would not have been possible without his help and outstanding hospitality, and without the help of The Long Riders' Guild!